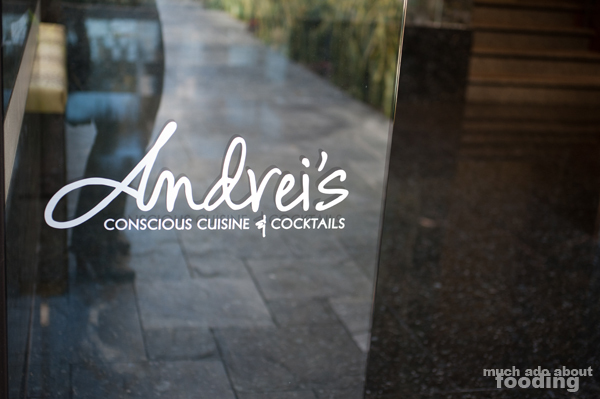 The full name is actually Andrei's Conscious Cuisine and Cocktails but to avoid having an extremely long title for the post, I'm just shortening it to Andrei's. Sounds more neighborhood-friendly, no? 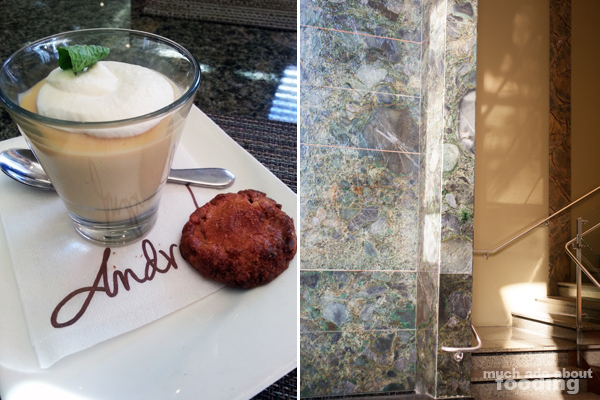 Then again, this place is set among office buildings and has a very business-class air about it. I came here for OC Restaurant Week, something they even publicize well by having the OCRW menus be the landing page pop-up when you go to their website. So there were three choices for starters off of this $20 prix fixe menu but we happened to choose the same starter. 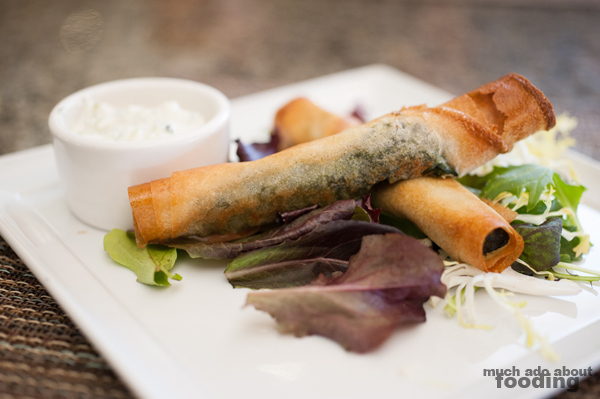 Of the spinach cigars, California field greens, and seasonal soup, we both picked the Spinach Cigars (roasted Feuille de Brick stuffed with spinach and Feta cheese & served with cucumber tzatziki). Crisp along the edges, perhaps we had waited a little too long with my taking of pictures because it wasn't as crisp in the middle for the wrapper. The filling was pleasant with enough spinach to offset any strong Feta. The cucumber tzatziki was a little more on the sour side than preferred but otherwise, had a good mix between saucy and chunky. I also ate the greens upon which the "cigars" sat. We didn't overlap on our entrees though so it was great to see what differences there were in style and cuisine. On the Restaurant Week menu were three choices: greek lamb pita, Andrei's chop salad, and shrimp fettuccine. We opted for the Greek Lamb Pita (Superior Farms natural ground lamb, cucumber, tomato, iceberg lettuce, red onion confit, Halloumi cheese, mint, pita bread, roasted basmati rice) and the Shrimp Fettuccine (Moroccan-spiced Mexican shrimp, fresh fettuccine, zucchini, tomato, cream reduction, pea tendrils). The amassed amount of food on top of my pita and the finely chopped nature of each ingredient made me opt for using my knife and fork on this beast. Every piece was fresh and vibrant but it was difficult to tell that the lamb was lamb by how finely ground it was. I greatly appreciated the sweetness the confit brought to the otherwise potential salsa-like vegetable arrangement. Unfortunately the side of rice was quite forgettable. My lunchmate's shrimp fettuccine was lovely with its spicy kick once the creaminess wore off. The pasta was a tad harder than expected but not distracting. The shrimp was cooked in just the right amount of time to give it its solidness and yet juiciness. An enjoyable entree! With two options for dessert, it was easy to pick just one of each. 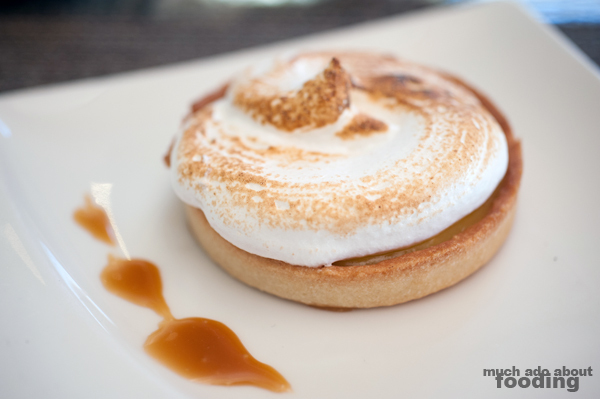 My Lemon Tart (California Farms organic lemon tart with Italian meringue) came in a thick tart shell and what could have been mistaken for toasted marshmallow on top but was really meringue. It was tart enough that I finished the whole thing without worrying about there being too much sweetness was in my dessert (don't have much of a sweet tooth!). I thoroughly enjoyed it. The other dessert on the table was the Butterscotch Pudding (butterscotch pudding, Chantilly cream, bourbon & pecan cookie) which we both agreed was underwhelming on the butterscotch side. It was much more like a vanilla pudding than anything. The cookie's flavors were lost as well and probably distracted from due to how hard the thing was. Nevertheless, as a pudding itself, it was very tasty and especially so if you weren't expecting a heavy butterscotch taste. 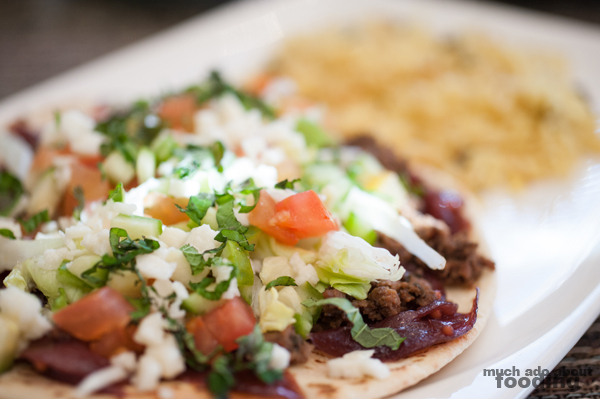 Looking for other bloggers chowing down during OC Restaurant Week 2013? 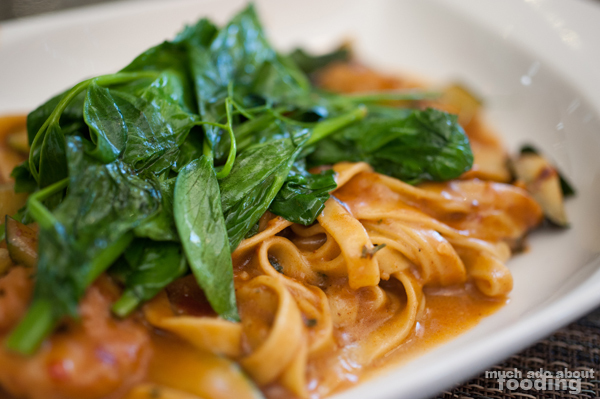 See who's writing at http://www.orangecountyrestaurantweek.com/OC_Food_Blogs_That_Rock.html!